How can I recognize a vestibular problem as a parent? Vestibular disorders may already be noticed at a young age. During the first months of life, weaker head stability, reduced eye movements to follow objects and a delayed roll over can possibly be signs of an underlying vestibular problem. When children learn to sit, balance and catch reactions might be reduced, which can cause a delay in movements during sitting. Additionally, it is possible that the child will take the first steps later compared to peers. Frequent falls have also been reported in children with vestibular problems. The child might experience difficulties when walking in the darkness or on a rough or bumpy surface. Due to poor body control during movements, older children will encounter difficulties when learning fine motor skills or e.g. ball skills. What are the expectations of the vestibular screening? A vestibular screening is strongly recommended in hearing-impaired children because they have a higher risk of problems situated in the vestibular organ. 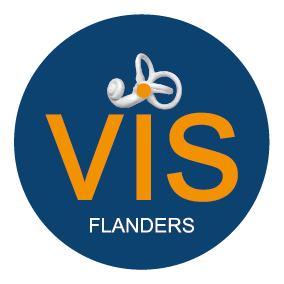 After determination of a hearing loss, your child will be referred at the age of six months to a reference centre of Kind en Gezin (Child and Family) to perform a vestibular screening. In children with a hearing loss, weaker performance on the vestibular screening might be expected. This vestibular screening protocol is able to detect the majority of the hearing-impaired children with vestibular problems. When a vestibular problem is confirmed, the doctor or audiologist will refer your child to a physiotherapist or a rehabilitation centre in the neighborhood to start further therapy. Which guidelines can I follow to help my child at home? Children with a vestibular dysfunction have to learn how to recognize difficult situations and how to adapt gradually to these moments. Walking in the dark without visual information or taking steps on a rough surface (for example walking on the beach, grass, a carpet, stairs,…) are difficult situations in which your child can use some extra encouragement. During the development of your child, it is important that your child can play, crawl and walk barefoot as much as possible. The child will receive more information of the feet to keep their balance during standing and walking independently. Solid shoes are an important point of interest when your child is taking his/her first steps. Decent shoes give sufficient support to the heel, are higher than the ankle and should have good soles for enough traction. Offer your child a large variation of motor challenges. This will help the child to adjust to different situations and to develop coping strategies for the future. For example, instead of giving something that he/she really wants, you let the child take it himself/herself. Especially when a hearing loss is confirmed, adjusted language and communication are important. Clear communication at eye level and using supportive signs might be valuable to your child. What are the expectations of a vestibular dysfunction when appropriate therapy is provided? Therapy can be started quickly by the physiotherapist or in a rehabilitation centre, if the vestibular problem is detected early by the vestibular screening. Children will learn during therapy and also during daily situations to adapt to and compensate for the dysfunction of the vestibular organ, in order to facilitate difficult situations. More information on the vestibular screening is found in the information brochure below. The impact of a vestibular dysfunction on a child’s development is not easy to predict based on the results of the vestibular screening. If an abnormal result was found on the vestibular screening, the child will be referred to a physiotherapist for an evaluation of the motor development. The results of this motor assessment can give an indication of the extent to which the vestibular dysfunction has an influence on the motor development and to which further follow-up is necessary. Dependent on the severity of the hearing loss, children with an abnormal result on the vestibular screening will be referred to a physiotherapist (in case of unilateral or mild hearing loss) or a rehabilitation centre (in case of severe hearing loss). An overview of the participating rehabilitation centres and pediatric physiotherapists is given below.